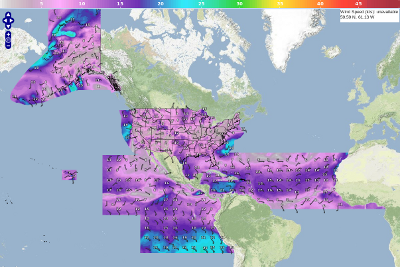 The Ocean Prediction Center's gridded marine forecasts are now available in the National Digital Forecast Database (NDFD). Gridded forecasts of marine weather elements are available over OPC's North Atlantic and North Pacific areas of responsibility (AOR). These elements are available at a spatial resolution of 5 km and a temporal resolution of three (3) hours out to 144 hours or six (6) days. The grids are produced by forecasters using the AWIPS Graphical Forecast Editor (GFE). The Atlantic basin and the Pacific basin grids will be available for forecast days 1-6 at approximately 4:20 UTC, 10:20 UTC, 16:20 UTC and 22:20 UTC each day. This schedule will be in effect beginning Tuesday, September 16, 2014 at 16:20 UTC. 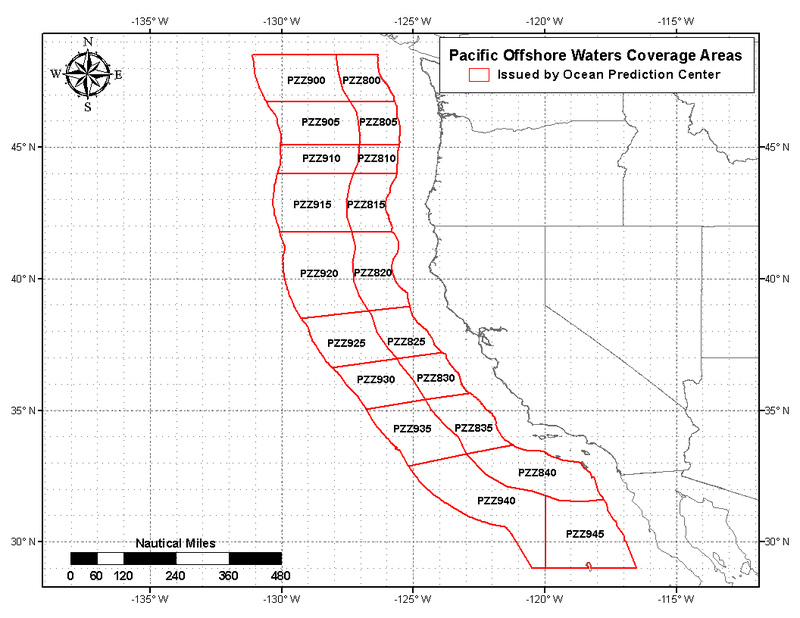 More information is available at http://www.nws.noaa.gov/os/notification/pns14offshore_highseas_aab.htm. NDFD posts new day 1-3 grid files 24 times per day. NDFD includes new day 4-7 grid files only for the issuances at 00 UTC, 06 UTC, 12 UTC, 18 UTC, and 22 UTC. For the oceanic domain, grid files are posted at about 20 minutes past the hour. NDFD adds a new forecast day (24 hours) once per day with the issuance at 22 UTC. Expired forecast grids are dropped throughout the day. More details regarding this service are available in the Product Description Document from the online catalog of NWS products and services. Please note the National Hurricane Center was first to distribute gridded marine products so there will be references to NHC in the documentation. The marine forecast images are available via the NDFD graphical interface. Select the "Oceanic" option to view wind speed, wind gusts, significant wave heights, and hazards for the National Hurricane Center, Ocean Prediction Center, CONUS, Alaska, Hawaii, and Guam areas of responsibility. 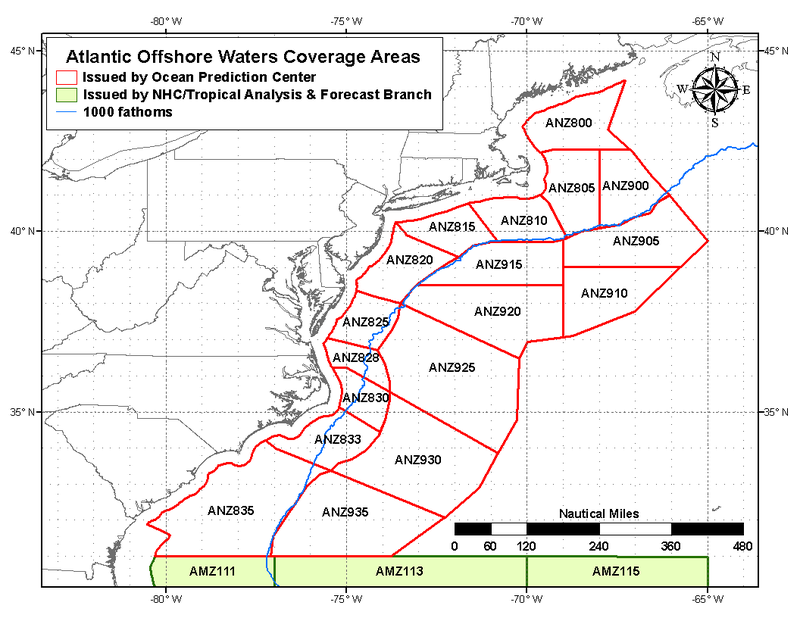 The NDFD oceanic domain covers the Atlantic, Pacific, and Arctic basins for the offices issuing offshore waters and high seas forecasts. The upper right lat, lon for this grid is: 79.99N, 10.71E. The lower left corner lies directly on an NCEP grid 204 point, which coincides with all other Pacific region NDFD grids. The lower left lat, lon for this grid is 30.42S, 129.91E. Specific information on the NDFD grid domains, including the oceanic domain, can be found at http://graphical.weather.gov/docs/ndfdSRS.htm. Technical information on accessing and using NDFD elements can be found at https://www.weather.gov/mdl/ndfd_info. Note: Areas of the NDFD oceanic domain that coincide with the NDFD CONUS domain are included in the CONUS grids as well. Use the NDFD anonymous FTP menu page to access the CONUS and other regional GRIB2 files. The marine elements transitioned from experimental to operational status on 6 February 2018.